Brahma bade Swayambu Manu and Satharoobai ( Brahma's body split into two to form Swayambu and Satharoobai) to reach earth and further life on earth. But at the time the earth was deep under the ocean after floods. Brahma prayed to Lord Vishnu to retrieve the earth from the depth of the oceans (Paadaala Logam). As Brahma was in Dyaanam (meditation), a varaha (boar) the size of his thumb came forth from his nostrils. Very soon, this varaham grew to be larger than an elephant. It was Lord Vishnu in his Varaha Avataram and he traveled to the depths of the ocean and reached paadaala Logam. There he found the earth and lifted it by his long front teeth. Hiranyakshan, an asuran rushed forward and stopped Lord Vishnu. He had come in search of Lord Vishnu for he was told by Varuna and Narada Maharishi that Mahavishnu was the only match for his valour. He ridiculed Vishnu on his form of a boar. A major fight ensued. Mahavishnu used his gada (mace) and his Chakrayudam (discus) to beat the asura. He finally hit him near his ear. The asura fell dead. 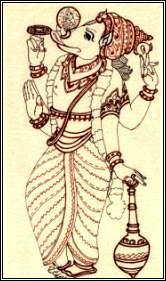 The Devas worshipped, praised and thanked Lord Vishnu. Mahavishnu, the boar then brought the earth up. Brahma asked Swayambu Manu and Satharoobai to live on earth and propagate life on earth.